A commentor has taken issue with my post about the number of NZ children living in workless families. 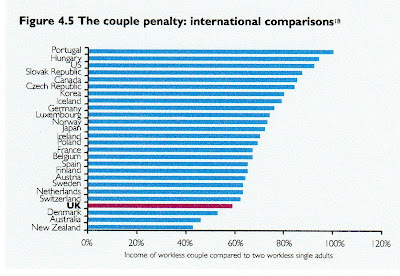 Apparently the European statistics were for households - not families. That was how the chart was labelled unfortunately. I didn't label it. To strengthen the work-first principle and increase the labour supply, the Government proposes a third step in the in-work tax credit and a reduction in total state income tax. The proposals have an overall scope of SEK 15 billion. The three steps combined mean that approximately 97 per cent of all people in full-time work will have received tax reductions of more than SEK 1 000 a month. The Government also presents a tax package for businesses that will lower their taxes by nearly SEK 16 billion in 2009. The aim is to strengthen incentives for companies to invest and take on new employees. The corporate tax rate will be reduced from 28 to just over 26 per cent and employers' social security contributions will be reduced by one percentage point. In addition, the administrative burden on businesses will be eased by a number of simplifications, as a step towards the Government's target of reducing the administrative burden on businesses by 25 per cent by 2010. The Summitt I attended on Wednesday was a hand-wringing hui about children affected by recession and what the government should be doing for them. My contention was child poverty in NZ is fairly constant. The recession has only broadened it. According to the NZ Christian Council for Social Services, at June 2009 there were 219,627 children relying on benefits. 13.5 percent of working age beneficiaries have a current earnings declaration meaning they had participated in work throughout or at some point during the previous 12 months. A crude calculation taking 13.5 percent off the total to get the lowest possible number of children with non-working parents produces 189,977. There are an estimated 1,083,690 children aged under 18 (NZ Statistics). 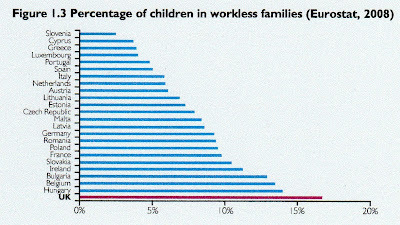 The percentage of children in workless families is therefore 17.5 percent. So how does that compare to Europe? NZ is higher than any. But when unemployment rates are laid alongside these countries, the picture changes. This strikingly illustrates the effect of the DPB. A Child Poverty Summit convened by the Every Child Counts organisation has recommended higher core benefit levels. As one of the 70 invited delegates attending the Summit welfare commentator Lindsay Mitchell says she did not agree with this proposal. "As a participant in the Social Exclusion workshop which made this particular recommendation, I argued against it. There are at least nine international research papers that show that an increase in benefit levels increases the number of children born outside of marriage or a stable relationship. This has the effect of drawing more children onto benefits, putting even more children at risk of the unintended consequences the Summit wants to reduce." "Additionally, the figures supplied by Every Child Counts show that of the children living below the poverty threshold 65,000 were in sole parent families. I emphasised that there are currently around 165,000 children reliant on a DPB income. If the majority are not below the poverty threshold, why increase the level of the benefit across the board? Factors beyond the income level are responsible for the poverty." Neither of these objections was dealt with indicating that the recommendation is more about ideology than enduring solutions. The study also found that throughout most of the 1990s around one in four children were included in a benefit at birth or very soon after. Since 2000 the proportion had declined to one in five children born in 2005 and 2006, and 18 percent of children born in 2007. Mitchell said that although the trend had been positive it was sobering to learn just how little record low unemployment had affected child reliance on welfare. "In 2005 New Zealand had the lowest unemployment rate in the developed world, yet one in five children were still being born onto a benefit." "The trend has now, however, reversed. A large majority of children relying on main benefits have a parent on the DPB and since 2007, the number of DPB recipients has grown from 96,467 (June 2007) to 104,400 (June 2009). Others rely on the unemployment benefit which has more than doubled from 23,159 to 50,855 over the same period." "...one in five children born in 1993 are estimated to have been supported by a main benefit for seven or more of their first 14 years of life. An estimated one in ten spent a total of 11 or more of their first 14 years of life supported by a main benefit. " Mitchell said that growing up on welfare has become a deeply entrenched facet of life for New Zealand children, one which seems largely impervious to economic conditions. "As long as the welfare system remains essentially unchanged, too many children are going to experience the varying degrees of disadvantage that go hand-in-hand with life on a benefit." Paula Bennett is impressed with 1,000 new subsidised jobs created after potential employers were offered $5,000 to employ a young person for six months. While I fully support the sentiment behind getting young people into jobs, distorting the value of their labour with subsidies is probably not the answer. The rules for the Job Ops scheme were tightened after initial publicity last month about a rush of employers seeking the subsidy. The criteria now state that jobs must be "opportunities that wouldn't exist if the Job Ops subsidy wasn't available". What a nonsense. There is no test of proof. For instance, it could be argued that a employer had previously advertised the position without subsidy. But the employer could counter, possibly truthfully, that he had changed his mind about offering a position due to the recession. Then he had changed it back when the subsidy became available. Or it could be argued that a young person is employed alongside others doing the same work unsubsidised. The employer could argue that he purposely produced one extra job that he couldn't have without the subsidy. Whether the opportunities would or wouldn't exist without subsidy will only become evident after the subsidy runs out. Hopefully, by then, at least some of those employed will have proved themselves to be worth it. "The case for legalising all drugs is unanswerable"
This is the first thing I read today and is probably the best thing I will read today. The title is a challenge. Those who want to keep on with prohibition should state their case as clearly and succinctly. But has anyone ever read such a treatise? Does one exist? It seems to me that prohibition continues largely because changing deep-seated but irrational convictions is just too hard. A decade or so ago, it could be argued that the evidence was not yet in on drugs. No one has ever believed illegal drug use could be eliminated, but there was a defensible view that prohibition could prevent more harm than it caused. Drug use is not a private act without consequences for others; even when legal, it incurs medical and other costs to society. A society that adopted an attitude of laissez-faire towards the drug habits of its citizens could find itself with higher numbers of users. There could be a risk of social abandonment, with those in poor communities being left to their fates. These dangers have not disappeared, but the fact is that the costs of drug prohibition now far outweigh any possible benefits the policy may bring. It is time for a radical shift in policy. Full-scale legalisation, with the state intervening chiefly to regulate quality and provide education on the risks of drug use and care for those who have problems with the drugs they use, should now shape the agenda of drug law reform. Is anywhere safe from naggers? Has anybody else noticed the public address messages now being broadcast when they are super marketing? There I am in, aisle whatever, just enjoying a trip down memory lane listening to some schmlatzy Whitney Houston number wafting through the speakers and in crashes Woolworths Marketing Manager advising me how many women are dying from cervical cancer and how important it is to have a regular smear test. Oh, I groan. For god sakes, is nowhere safe from these naggers. It's a gross invasion of my consciousness. Like NotPC last week, I am up to here with it. Leave me the hell alone. And just as private charities are now thinly disguised government agents, so are private enterprises that buy into public health indoctrination. I think I am going to change my shopping habits. But I am assuming that Progressive Enterprises has the same policy across their chain. Anybody been assaulted at a Pak'n'Save lately? Another study from David Fergusson et al., based on the Christchurch birth cohort of 1,265 was published in Social Policy, recently posted on-line. It addresses the role of Maori ethnicity in childhood maltreatment. The finding that Maori children were not at greater risk of sexual abuse didn't surprise me, although the author states it is in contrast to common assumptions and other research findings. I seem to recall CYF statistics I requested under the OIA confirm Fergusson's findings. In the area of experiencing serious and severe physical punishment and exposure to parental violence however Maori had higher rates. A third framework, focusing on the role of cultural identity has, over the preceding two decades, been the dominant explanation employed to account for the ethnic asymmetry in child maltreatment rates in New Zealand (Balzer et al. 1997, Keddell 2007, Kiro 2000, Ministry of Social Development 2006, Pihama et al. 2003, Stanley 2000, Stanley and Thompson 1999). This view proposes that it is the degree of association that Māori families have with Māori kin groupings and the level of commitment they show to traditional customary practices that will influence the likelihood of Māori children experiencing maltreatment. From this perspective, strength of Māori identity in families is a protective factor for child abuse, and a lesser identification with Māori cultural domains may increase the risk of children being exposed to maltreatment. Intervention guidelines for child abuse have therefore been specifically developed for Māori, by Māori (Kruger et al. 2004, Stanley 2000, Stanley and Thompson 1999). These focus on determining the levels of affiliation Māori families have to cultural domains and the strength of cultural identity of individuals who reside in the family. Reattachment of Māori families to cultural domains and customs has therefore become a key feature of current child abuse intervention efforts. 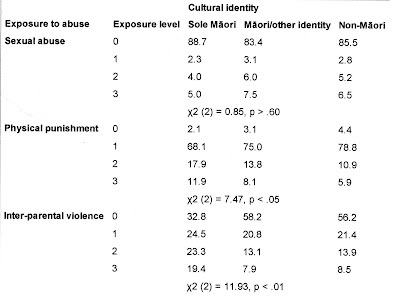 The results suggest that sole Māori identity may be a risk factor for exposure to physical child abuse and inter-parental violence....These findings do pose a challenge to current policies aimed at reducing the over-representation of Māori children in rates of child maltreatment, which emphasise “identity interventions” that are not evidence-based and are largely ideologically driven. Even though such policies are no doubt well intentioned and observe statutory requirements unique to the New Zealand context, following the view expounded by UNICEF (2003, 2007), they must be exposed to ongoing critical scrutiny and empirical evaluation. Surprise, surprise, I have been invited to attend this child poverty summit next week. Surprise because generally, the views of Every Child Counts and mine would clash. But let's see. I'm keeping an open mind. Every Child Counts, a coalition of non-government agencies that includes Barnardos, Unicef, Plunket and Save the Children, estimates that of the 60,000 children born in New Zealand this year, 10,000 would be born into in poverty. That'd be right. Around 3,000 to mothers who have no form of support even while pregnant and relying on the sickness benefit. 6,000 to mothers aged 28 or less granted their first DPB before the child was 12 months old. 5,000 babies added to an existing benefit. But this is normal behaviour. It goes on outside of a recession. There are probably valid reasons for it increasing during a recession. 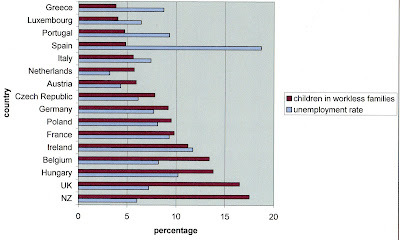 Unemployed men are more dependent on their DPB-incomed partners and more babies equals more income. Job opportunities are fewer for females and motherhood is a viable alternative. Of course what worries me is the summit will be looking for greater transfer of wealth so the needy have more money in their pockets. Whereas my view is always that the more bad decisions and behaviours are rewarded, the more they happen. What about a transfer of wealth framed differently? If more of the babies being 'born into poverty' were (openly) adopted out to parents with the means to raise them, the desired wealth-sharing would still be achieved. Be it would be achieved voluntarily and quite possibly, with better outcomes for all parties. Rather than spending more on benefits why not reward people for not having more babies. Give them a bonus for turning up for their long-acting contraceptive injection. It wouldn't be a difficult scheme to implement. What about paying some attention to those industries where there is demand, like aged and childcare? Surely there is an opportunity to match some of the DPB population with that demand. With those sorts of ideas I will probably be a fish out of water, a whale out of water even, but that's OK. There are those who agree with me and someone needs to take their ideas to the table as well.